Leonardo drew a series of geometrical bodies for the manuscript versions of Luca Pacioli’s treatise on proportions. Two of the original manuscripts have survived. The copy in the Biblioteca Ambrosiana, Milan, is dated 1498 and is of superior quality. It is dedicated to Galeazzo Sanseverino, commander of Ludovico Sforza’s army. The other, which is now in the Bibliothèque Publique et Universitaire, Geneva, was dedicated to Ludovico Sforza himself. It appears to be a compilation of notes and illustrations of lesser quality, probably compiled after the departure of Leonardo from Milan. Luca’s treatise was published in Venice in 1509. Each of the regular solids together with some of their derivatives are illustrated in solid and skeletal form. The engravings of the more complex forms are based on Leonardo’s drawings. 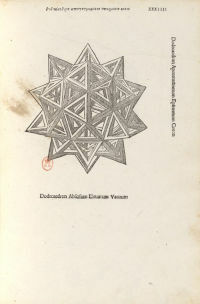 The body illustrated in this engraving is a dodecahedron (twelve-sided). It has been truncated to produce triangular faces, and then stellated with equilateral pyramids added on each of its faces. The engraving shows the skeletal form drawn in perspective. It is possible that Leonardo drew such complex geometric bodies with the aid of a drawing frame or “perspective window” as illustrated in the Codex Atlanticus for the depiction of an armillary sphere.